Summoning allows players to receive additional Servants, Craft Essences, Experience Cards, and Status Up Cards. There are two primary types of summoning: Saint Quartz summoning and Friend Point summoning. Saint Quartz summoning is used to obtain Servants and Craft Essences with a 3-5★ rarity for either 3 Saint Quartz or a Summon Ticket per individual summon, or 30 Saint Quartz for 10 at a time. When performing a 10x summon, you are guaranteed to summon at least one Servant and one gold card (4 or 5★ Servant or Craft Essence). 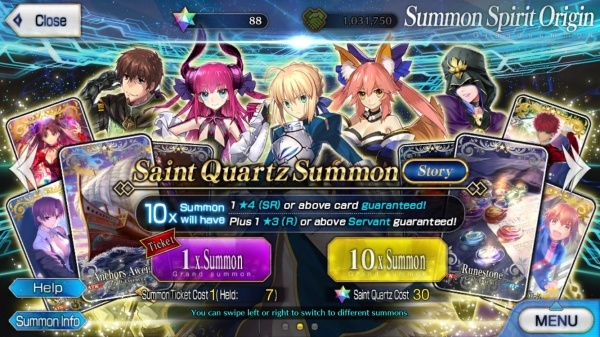 You cannot perform a 10x with Summon Tickets; you cannot spend Quartz on an individual summon if you own any Summon Tickets. Sometimes when a 4-5★ Servant is summoned, the summoning animation's ring of spheres will spark gold (which denotes a guaranteed 4★ OR 5★) or rainbow (guaranteed 5★). Additionally, when a servant card is double sided, it is guaranteed to turn gold. Based on the rate of 1% chance to obtain an SSR. The story banner pool consists of only permanently-available Servants and Craft Essences. Unless a card is made permanent, it cannot be summoned from this banner. Some Servants are only available after completing main story chapters. Additional banners for Saint Quartz are available for a limited time during events and promotions. 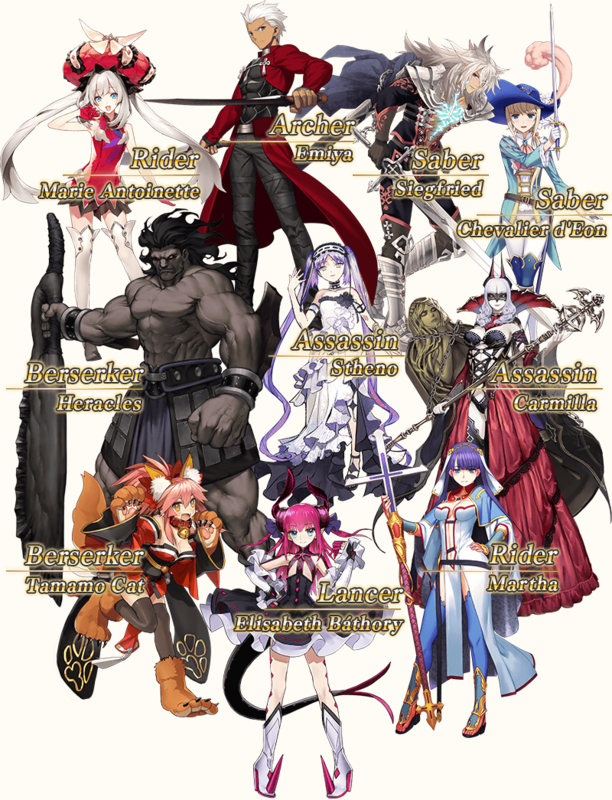 For each of these banners, the Servants and Craft Essences available may be different. To check the list of cards in the current summoning pool, tap the Summon Info (召喚詳細) button in the lower left. Limited banners may allow you to summon Servants without yet having completed their story chapters. However, story-locked Servants not featured as a rate-up cannot be summoned from limited banners. Limited banners offer a rate up for specific Servants. The chance of summoning any 5★ Servant is still 1%, but there is a higher chance it will be a rate-up Servant (approximately 70% chance for a rate-up Servant based on empirical data). Likewise, 4★ Servants still have an overall 3% rate, but you have a 50% chance of getting a rate-up 4★ Servant. Some Servants can only be summoned from limited banners. These are colloquially known as "Limited Servants." There are no plans for them to be permanently added to the summoning pool, but they may appear again in future limited banners. See Limited Servants for more information. Rarely, Servants are released before their main story location has been released. These Servants are temporarily limited but are added to the permanent summoning pool later. Some limited summoning campaigns, such as the Thanksgiving Special Guaranteed 5★ Summoning, require the use of paid Saint Quartz. When confirming a Saint Quartz summoning, the amount of paid Saint Quartz is denoted to the left of the amount of regular/free Saint Quartz. Paid Saint Quartz can only be obtained by paying real money to purchase Saint Quartz packages. Note that the Saint Quartz packages contain both paid and free quartz (the bonus quartz counts as free, not paid), so, if you want to perform a paid quartz summoning, make sure you factor that into your budget/purchase. Friend Point summoning can summon any non-limited card 3★ or lower. 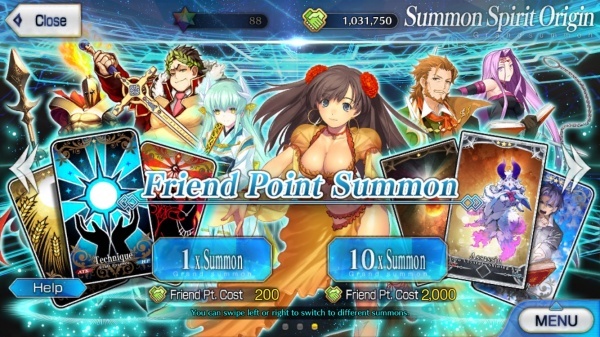 FP summons cost 200 FP for a single summon, or 2000 FP for 10 at a time. During events and promotions, some limited cards are included in the FP summoning pool. Currently, FP summoning is the only way to obtain Angra Mainyu (JP) as well as some 3★ Craft Essences. Prior to the 7M Downloads Campaign update in the Japanese version, players were given a single free FP summon per day. Now, players get a free 10x FP summon each day (resets at 00:00 UTC (NA) and 00:00 JST (JP)). After the tutorial, there is a forced Saint Quartz summoning. All players are guaranteed one of the 4★ Servants from below and one 4★ Craft Essence. NOTE: You will NOT be able to obtain a 5★ Servant from the Starter Summoning. For Saint Quartz summoning, the chance to summon 3★ Servants and 3★ Craft Essences is currently equally 40%. In the Japanese version, prior to the release of Okeanos, the chance of summoning 3★ Craft Essences was much higher than that of 3★ Servants (60% to 20%). 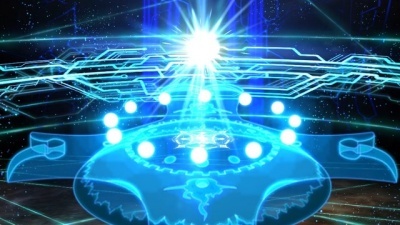 Starter Summoning was introduced in the Japanese version with the release of E Pluribus Unum. Before, the tutorial summon only guaranteed a 3★ Servant. Prior to the game's 1st Anniversary in the Japanese version, it cost 4 Saint Quartz for one Saint Quartz summon before being changed to requiring 3 Saint Quartz in both the JP and NA versions of the game.